I’ve always believed that if you like something, then it works. It might not follow the norm, or be what everyone else likes, but that’s ok. It’s your home, and if you walk in the room and feel happy, then by all means, you go with it. Case it point, listen to what happened to me yesterday. I bought a rug from Target a few months ago for the office. As you know, the office has been the slowest makeover in history. 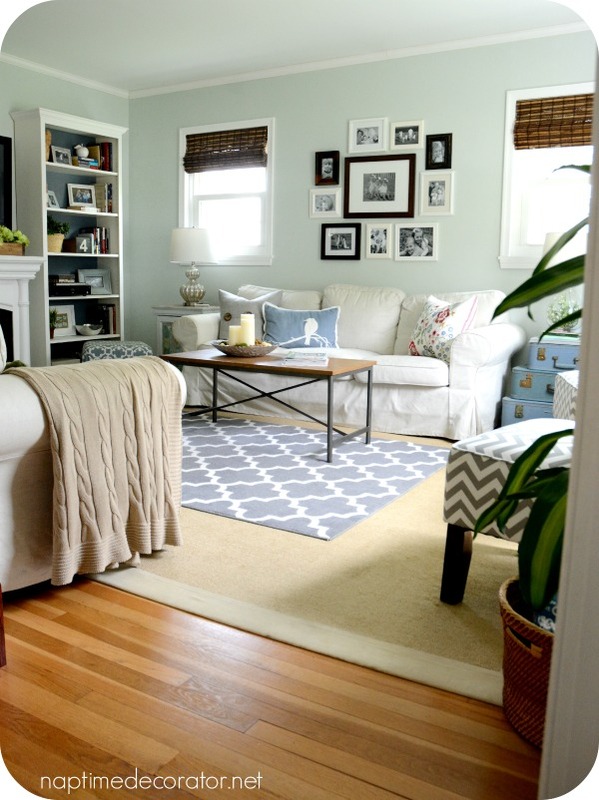 I knew I wanted to go with grey, so I bought a grey and white rug, even though we hadn’t gotten very far in the room. Well, now that we are finally getting somewhere, I realized this rug wasn’t vibing with me anymore. It’s a great looking rug, but I changed my mind and wanted to go with a natural fiber rug – one that doesn’t have a print that’s competing with the busy chair cushions on our office chairs (all will be revealed soon, I promise – we’re getting there!). Just too many prints going on with this rug in the room. I was thinking about trying to sell it, since it’s pretty much brand new, but then had a light bulb moment. What if I tried putting it in the family room, OVER the existing rug?! I’ve never thought about layering a rug on top of a rug in there, but the color works, so why not see give it a go? At first I thought, Is it weird that I have two area rugs? And then I thought, You know what? I don’t care! It looks nice to me, so why not? Best part is, if I want to go back to the way it was, it’ll take all of 20 seconds to pull up the area rug. Just another example of my design mantra: If you love it, it works. Have you ever tried something that sounds a little out-of-the-norm, but realized you loved it and went with it anyway? I’d love to hear about it! I have that same rug from target, but the white parts get dirty so quickly! How do you keep it so clean? Same goes for the Jute rug (especially the edges) – tips to keep them clean from wear and tear? Thanks! The edges of the faux sisal rug do get a little dingy. I use plain ol’ soap and water when it gets dirty and it works pretty well. It’s only like that on the one spot where you enter the room! The rest of the border stays clean. And haven’t had a problem with the white party getting dirty – maybe b/c mine is on the small side, so it’s not like a “main” rug that gets used to death, more like just an accent rug? Unrelated question….what is your wall color? It’s Sherwin Williams Sea Salt, 75% of the formula to make it a little bit lighter. I got rid of my ugly melamine bathroom floor and wall cabinets and replaced them with a full height glass door display unit which I shabby chic’ed in blue and white. It houses everything from towels to tooth brushed and we all love it – and it looks so cool! 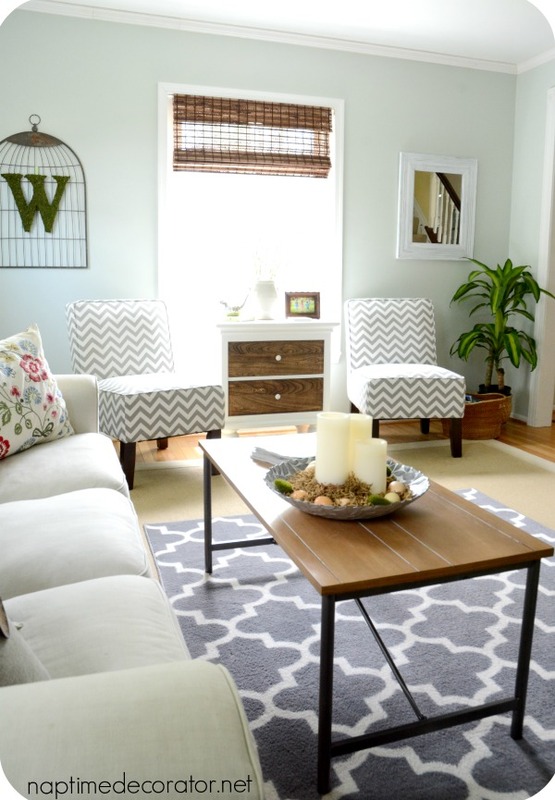 Wait….isn’t that your night stand between the chevron chairs? What are you using for a night stand? Good eye, Carrie! 🙂 It is – I was trying it out just to see, but it’s going back to the bedroom. I love it in the family room, but I love it in the bedroom more! Swapped it out with another white table we were using in the family room. I agree…what works for one may not work for another. If your happy with it, that is all that matters. I think it looks great. Anchors everything greatly and adds texture. Hope you have a blessed week, Liz! This looks great. I’ve done this in my dining room but I’ve had the problem of the ends of the top rug curling up and trying to kill people when they walk by. Do you have any advice on how to fix that? Or is that maybe a sign of a cheap rug? Where did you get your large rug? 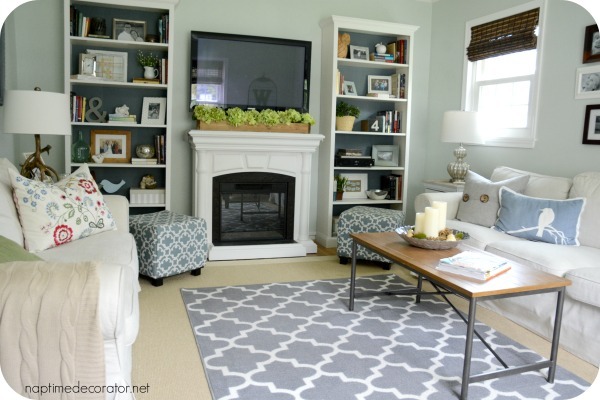 I have been wanting to layer my rugs in my living room for the past 7 months – but I haven’t been able to find a large sisal that I like! 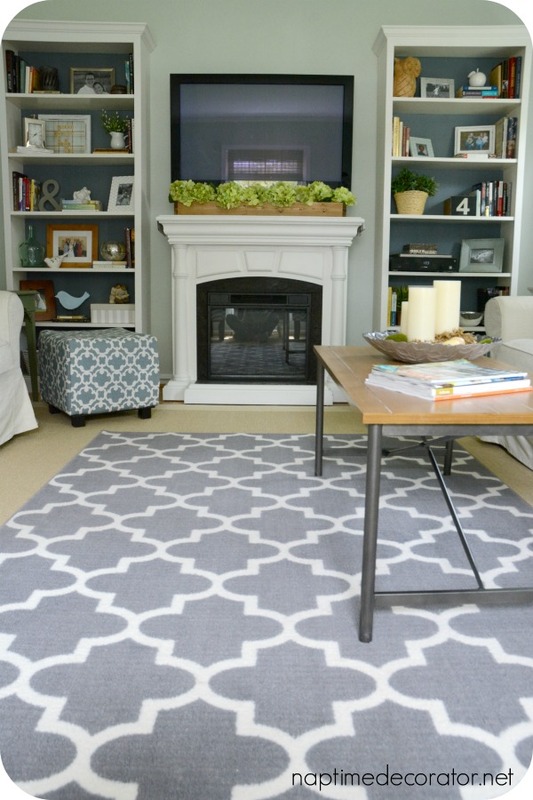 Got it at homedecoratorscollection.com – think it’s called the Cove rug?